Now that I work out of my spare bedroom—which is about 80% of the way towards becoming a fabulous home office; total makeover photos to come soon but let me just say right now that navy blue walls are the best—I have had the delightful experience of discovering that I can make pretty much anything I want in my very own kitchen, particularly as no-one is going to leave a passive-aggressive note afterwards requesting that I please try not to burn the microwave popcorn. Anyway, now that I work from home, I certainly have my fair share of lunches that are constucted from an assortment of various crackers, condiments, and random jars of shelf-stable stuff, but I have also discovered the divine pleasure of making a salad in my own kitchen every day, a salad that is both healthy and slightly naughty, does not have to be ordered under pressure and eaten with a plastic fork from a plastic container, and—most importantly—does not contain the dreaded combination of mango and egg. First of all, you need some lettuce. I have become obsessed with butter lettuce, and I have found what I think might be the world's best butter lettuce at....Costco, of all places. It comes two heads to a pack, and it is so fresh that it still has the roots attached. The whole thing is not even three bucks, and I usually get four salads from two heads. Here are some fresh figs and some chopped up strawberries. Sometimes I use fresh figs and chopped up strawberries but sometimes I don't have fresh figs and chopped up strawberries, and in that case I use whatever fruit I have. Fruit on a salad is one of life's greatest pleasures, and if you disagree, then this is probably not the salad for you. Today I had no fresh figs or chopped up strawberries, so I threw some blueberries on instead and it was incredible. Frequently, I also add dried cherries. After that, I add the cheese. This, needless to say, is the best part. This is goat cheese, because I like the way it tastes with the strawberries. But sometimes I do not have goat cheese—are you sensing a theme here? I am really bad at grocery shopping—and then I use crumbled blue cheese instead. The crumbled blue cheese goes really well with the dried cherries, FYI, but then I think crumbled blue cheese goes well with anything, maybe even raw chicken that has been left on the kitchen counter in a moldy gym sock for four days. Okay, maybe not that. Finally, for the pièce de résistance of my salad, I add some nuts. My nuts of choice are these incredible candied walnuts which are about five thousand dollars a bag at Trader Joe's, but you only need to add them sparingly to get a fantastic crunch. So there we go, that is my salad, and it is kind of the best thing in the world. And this is what it looks like with my diet ginger ale next to it, because I am going through a brief diet ginger ale phase right now, except it has lasted, like, two years, so maybe it's not so brief after all. I think I like diet ginger ale because it reminds me of traveling. I always order ginger ale on the plane. Anyway, I know no one cares what I had for lunch—coming up next: let me tell you the scintillating story of what I dreamed last night!—but trust me, if you ever need a delicious salad idea, remember that butter lettuce + balsamic vinegar + fruit + cheese + nut is always a winner, no matter the combination. Do you have a favorite salad that you could eat for 25 days out of 33? I mean, it's not like you're going to be able to persuade me that it's better than mine, but you could try. Looks awesome, but my question is are you actually full? I work from home too and lunch is a constant struggle. Mainly because I can't seem to get the "filling" part right and I am either starving/snacky again at 2 or falling asleep at my desk. In other news, I adore balsamic in any form, but have you tried cherry tomatoes sauteed in balsamic? It's like candied crack. The salad looks completely amazing; so much so, that I think I'm having it for lunch tomorrow instead of the smoked chicken salad I had planned. You can keep your ginger ale, though - I like proper spicy ginger beer. Old Jamaica is best. They even do alcoholic ginger beer, now, and that really rocks. Nothing wrong with only Balsamic vinegar on salads, it's very British! Sometimes yes, I mix it up with a bit of olive oil, but normally use it straight up. I love the sound of this veggie friendly salad, I will try it this weekend. Am curious as to what Figs taste like, have never had them! I have a couscous salad that I make a few times a week because it's so easy and keeps in the fridge so well. Mix couscous, zucchini, cherry tomatoes, green onions, chick peas, feta and Renee's Greek Feta Dressing (you can only find this is Canada though). Eat it cold. It's super filling and healthy as long as you don't over do it on the dressing. Oooh this sounds amazing! For dressing I usually do a spoonful of good olive oil, some lemon juice, and salt and pepper. Simple perfection. I love a fruit and nut salad but my husband says fruit and nuts do not belong on a salad (heathen! )so I make them for myself. I really like craisins and feta cheese with almonds but I have to add a little bit of grilled chicken as well or I'm starving in an hour. Did you know Fazoli's has a new chopped salad with dried cherries, almonds and chicken? It has a really light cherry vinagrette on top and is delicious - and cheap! Sounds great! My favorite salad is very similar, baby spinach is my lettuce of choice (can I even call it a lettuce? ), balsamic vinigarette, dried cherries, toasted walnuts, gorgonzola cheese, if I can't find gorgonzola, I'll use goat cheese, not as strong, but still YUMMY! Since I moved to France, I have completely stopped using bottled salad dressing as my fiancé can't stand it. We dress our salads with olive oil, balsamic, salt, pepper and voilà that's it. Also, we recently discovered Cream of Balsamic Vinegar which is like heaven in a bottle. Basically it's super thick, "creamy" balsamic you can use on salads or even fruit if you love balsamic you must try it- a-maz-ing! My current favourite salad is tomato slices, topped with alternating avocado and mozzarella slices , sprinkled with chopped up onions and tuna then drizzled with olive oil/cream of balsamic. I have eaten it almost every night this summer! I have no salad I could eat for 25 out of 33 days and I have the waist line to show for it unfortunatly. But, I wanted to say I could bathe in that particular Basalmic from Trader Joes (well maybe not bathe, it would sting if I had a cut or a torn cuticle, but you get the idea). It is so freaking delicious and not expensive at all when you think about the cost of some other fancy schmancy basalmics. 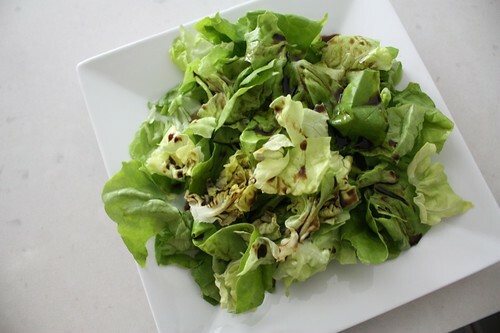 We gave up bottled salad dressing ages ago for that very same bottle of balsamic vinegar. If you want a creamy dressing, no trouble at all to put a bit of oil, lemon juice, garlic... in a jar and blend until creamy. You're missing out if you still use bottled salad dressing. I must respectfully disagree with you; fruit on a salad is NOT one of life's greatest pleasures. For some reason, I can't stand it. The flavours just don't seem to go together. The bane of my existence is raspberry vinaigrette. Everything else in your salad sounds delightful though! Butter letter is THE BEST. I've taken to drizzling honey or agave nectar on my salads. So good! 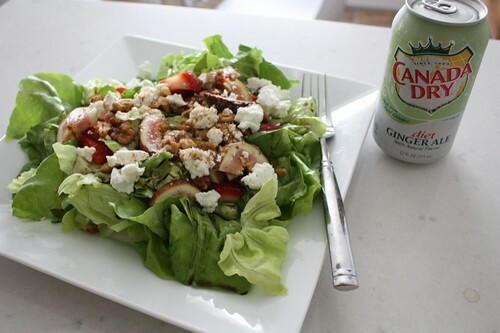 I thought I was the only one that like ginger ale on a plane :) Butter lettuce is the perfect choice for salad as well... I think I know what I will be having for lunch today! My cousin makes your very same salad (minus the fig) for family gatherings. It took me quite some time to try this, as I was VERY anti fruit on a salad. And ginger ale is the only choice for airplane travel! I knew I like you for a reason. and, I think goat cheese would be good on it...but most other cheeses wouldn't work for me with this particular salad...I rarely have goat cheese at home...sad. I too love balsamic vinegar. My lunch in the summer oftena caprese salad consisting of heirloom tomatoes, mozzarella cheese, and basil with balsamic vinegar. I don't even bother with the olive oil because I love balsamic too much to dilute the taste. Yum! I make a salad where I go buy everything crunchy from the produce section: cucumbers and peppers and radishes and a red onion, carrots, fennel, jicama.... that sort of thing. Then I dice it up, at halved cherry tomatoes and white beans, then a mayo/vinegar/parsley/cilantro dressing. I make HUGE quantities of this stuff and it's always gone in 3 days. But do you go away from your computer and enjoy it at the table or do you eat at your desk? THIS is the thing I need stop doing. that and resorting to ham and american cheese sammiches because they are fast and easy. Aslo? 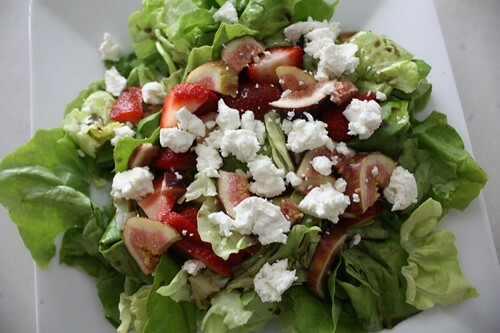 I do NOT like fruit on my salad but will take the butter lettuce and goat cheese for SHO'! Boston lettuce (aka butter) is my fave. However, I hate fruit on salad, and I've come to dislike balsamic vinegar. I pretty much eat the Boston lettuce with a combo of corn oil and red wine vinegar (3 parts oil to 2 parts vinegar) with nothing else on it. Maybe sometimes a scallion. But I don't often eat a salad on its own, just as a side dish...salad leaves me hungry on its own, no matter what. My favorite salad looks almost just like that! Except I add some fresh basil (cut with kitchen shears because I'm lazy) and a little bit of diced shallot (if I have it, see: lazy) and some avocado. Perfection. Honestly, how could you put anything other than straight balsamic vinegar on a salad? Once I tried it, I was HOOKED! My favorite in the summer is to take leftover grilled vegetables (mushrooms, onion, zucchini, etc.) and chop them up, then add them to greens. I top with cheese (any kind) and avocado and tomatoes and some balsamic. Delicious. Tell me more about these figs. I've never had figs, unless you can consider Fig Newton bars figs? I'm guessing not. How do you know which ones to buy? How do you slice them? How many should you buy? What do they taste like? What else can they be used for besides salads? Of course, I guess I could just google this. Is it sad that I do, in fact, have a favorite salad that I could eat 25/33 days? Here's the mix: the fresh herb salad at Whole Foods (it has dill and cilantro in it, YUM), then a lot of balsamic and a little olive oil. To that I had rotisserie chicken, crumbled blue cheese, and dried cranberries. Sometimes I do goat cheese (especially Humboldt Fog) instead, or blueberries instead of cranberries. Argh. Your blog ate my comment. Here's the short and sweet version. Lettuce + prosciutto, torn into small pieces + sliced farm fresh OMG so juicy peach + shaved parmesan chunks + balsamic vinaigrette. i love a salad with avocado on it. recently had a salad at a local restaurant and the avocado had been sliced into wedges and the wedges - i don't know - grilled or seared - they were crispy on the outside and delicious creamy avocado on the inside. so amazingly delicious that i'm still thinking about it weeks later and wondering when i can go again. also had hummus, pico, and what they called gazpacho vinaigrette on it. i'm also a ginger ale girl when flying. strangely i don't drink it any other time (discounting the few and far between bourbon & ginger ales with a slice of lime). i don't even drink soda at all any other time. but put me on a plane and Ginger Ale is all I want. i, too, love a good lunch salad. i made one recently that was tomato, corn, zucchini, goat cheese, and a few other things all combined and dressed with some lime juice. the goat cheese sort of melted into the rest and it was delicious. 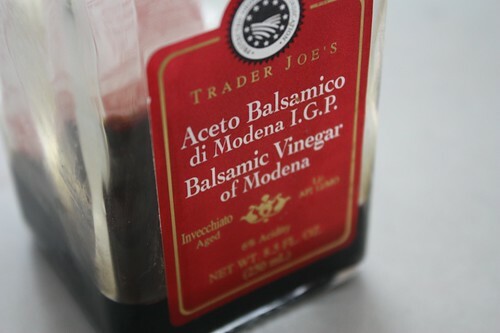 i'll have to try the trader joe's balsamic. another one of theirs that's great on salad on its own is the orange muscat champagne vinegar - it's citrus-y and a little sweet - really good. So I don't know if you're going to believe me or not...but I always order ginger ale when I'm on an airplane! I fly infrequently, unlike you, but have ALWAYS ordered ginger ale. Why? I have no idea. But think it's funny that it also reminds me of travel. So now I think maybe I should go buy a pack, so I can at least get that travel feeling, even though I have no immediate plans of going anywhere. Lovely. I never buy bottled salad dressing anymore, and now when I have it, I can't stand it. I am a walnut farmer, and of course I eat them all the time, especially on salads. Sugared walnuts are so easy to make, and don't cost a fortune, though. Start with several tablespoons of sugar in a nonstick skillet, heat over high heat until it liquifies (don't leave the stove! ), toss in some chopped walnuts, and stir until they're coated. Cool. Eat. Sorry I don't include measurements. I usually just eyeball it. I build salads like this all the time, but sometimes instead of cheese (or, let's be honest, in addition to) I use avocado. And I know you said egg and mango, never again, but I also like scrambled egg in there, too. Combinations and possibilities are endless, and sometimes no dressing is required -- especially if you wrap the salad up in a wheat tortilla or wheat pita and take it on a plane for midflight snacking. YUM! "Eschew" is on my Top Ten Favorite Words List. Please, please tell me you're using the honey goat cheese from Trader Joe's. It is soooo good with strawberries. My favorite salad is a greek salad with some type of leaf lettuce, tomato, cucumber, onion, feta and a greek vinaigrette i make. 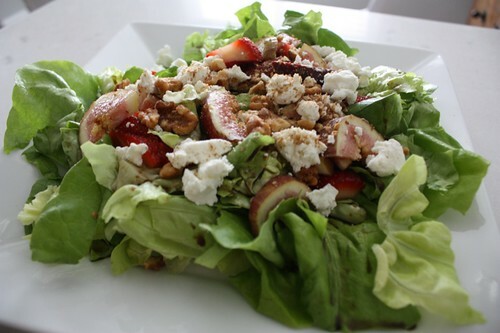 I do make a fruit and nut salad that is my boyfriend's favorite...it's typically some type of lettuce with craisins, apples, feta and pecans with a white wine and thyme vinaigrette I make. He loves it an could eat it every meal. One tip... you can buy the big back of walnuts or pecans at costco and candy them yourself. You can easily find a recipe to make them in an oven with egg whites online...and it's much cheaper. If you make a big batch you have them ready anytime you need them. This sounds delicious! I've never had TJ's balsamic but I'm definitely making a trip out there today for some now! My favorite salad is kind of similar. I do baby spinach, candied walnuts (too bad you guys don't have Wegmans out there, they have bags of them for cheap!) chopped apple, dried cranberries, feta cheese, sometimes chicken, and I use TJ's gorgonzola, cranberry and walnut dressing on it. I feel like goat cheese, feta, and crumbled blue cheese are kind of interchangable in these kind of salads! I am all about skipping salad dressings, but Trader Joe's actually does two EXCELLENT vinaigrettes. One is champagne vinegar, pear and blue cheese and what you do is you take baby spinach and pear and blue cheese and nuts and drizzle it with this dressing and then sing praises. ALso eat with fresh baguette. The other dressing is a cranberry/walnut/Gorgonzola and it is really good with spinach and dried cranberries and walnuts and gorgonzola. Oh and red onion, sliced verrrry thinly. Mmmm. Your salad also looks great. Also, bacon makes any salad just a bit better and less healthy. When I was working in San Diego, for the months of August and September, pretty much all I ate (sadly, this isn't hyperbole) was a fruit "salad": sliced green Bosc pears (green as in unripe, not green as in color, since obviously all Bosc pears are green, unless they're overripe in which case they're slightly yellowish), mixed berries (often frozen and unthawed), nonfat vanilla yogurt and sometimes a smattering of granola. If I was feeling exceptionally lazy, it was just a salad of sliced pears. All day, every day, and I never got sick of it. That's funny—ever since we moved across the street from where I work, I eat variations on that salad nearly every day at home. Sometimes I candy my own pecans. I also like sliced almonds as a nut option. Also good: blueberries with goat cheese and sliced almonds sliced almonds. Strawberries with chunks of mandarin oranges and sliced avocado. I eat a very similar salad most of the summer too, and I get the majority of the ingredients from Cost Co: butter lettuce (sometimes I get the big box of mixed spring lettuce and the container of spinach leaves and mix them together), strawberries, blueberries, avocado, cherry tomatoes (although I switch to sungold once they're available at the farmers' market), dried fruit from Trader Joe's, and straight balsamic vinegar. 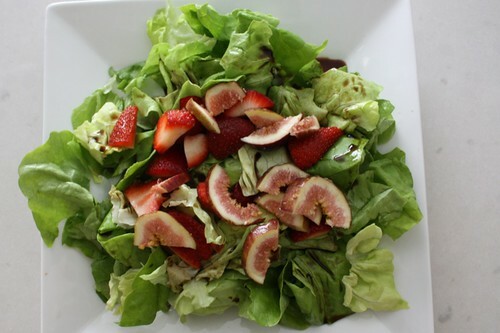 I will add/subtract based on what's in the kitchen, but mmmmmm, strawberries and balsamic are already delicious together so adding some lettuce makes it a meal! I used to obediently mix balsamic and olive oil for bread dunking at Italian restaurants but then I realized I just want the balsamic on my bread. That's when the light bulb went off over my head about salad dressing too. I know, I know, the oil helps the balsamic cling to the lettuce, but if you dress the lettuce before adding all the other goodies then you don't need the oil as much. I also recently discovered the joy of chia seeds, which are super good for you but can also be soaked in almost any liquid to become almost like a gel. I now soak a spoonful of chia seeds in balsamic vinegar and then use that as my salad dressing. Come on, you live in San Francisco now, so your salad needs to have some kind of hippie ingredient, right? Butternut pumpkin, capsicum, Zucchini, mushrooms, onions (whatever vegetables you want to roast but I don't recommend eggplant). Rest of salad consists of rocket, cherry tomatoes and feta cheese coarsely chopped. Mix all ingredients together. Add a bit more olive oil and a dash of balsamic. A bit more salt and pepper wouldn't hurt. Holly - check out Smitten Kitchen's candied nut recipe. I made them for a family Christmas gathering a few years ago, and now people actually get upset if I don't bring them every year. They have a bit of cayenne, which gives them a nice kick. And they're super easy, and you can make huge batches with nuts from Costco! KALE SALAD. So simple, bright, fresh and healthy. Finely chopped kale + crumbled feta, drizzled with a dressing made of olive oil, fresh lemon juice, chopped shallots, salt & pepper, and a drop of agave or pinch of sugar. I love this salad! I made this salad! Except I live in Australia, so no Trader Joe's. So instead I had spinach leaves, balsamic glaze, strawberries, persian fetta and almonds. Kind of totally different, kind of the same!! I love!!!!!! Thanks for the tip!! i read this post a few weeks ago and thought about sharing a link to a foolproof recipe for candied nuts, as several other commenters did. i was a little smug about my simple money saver, as i hate how expensive those addictive TJ's nuts are. shortly after reading, i set out to make a new batch: i put the sugar in the pan and impatiently stirred until the sugar finally melted ...i added the nuts and dumped on parchment to cool. only then did i noticed that i had used a plastic spoon on a hot pan and it had melted entirely down to the handle and mixed with the hot sugar. i was left with plastic candied pecans, an enormous mess, severe nausea from inhaling burning plastic fumes and possibly a lifelong aversion to my favorite salad topping. lesson learned? there is never a point in trying to recreate Trader Joe's products. For the last week I have been eating two salads a day-big ones that fill up about 3/4 of a regular sized dinner plate and along with that I have been eating Trader Joe's sesame seed tortilla crackers spread with a little homemade pimento cheese. I discovered arugula this summer...I'm a little behind the times...and I LOVE it. I especially love the organic that my local farmer's market sells, but I'll take the grocery store brand as well. To that I always add small tomatoes, black olives, parmesan or feta cheese, 1/2 of an avocado, coarse salt and fresh ground pepper and whatever dressing I have available. This past week I enjoyed a "grilled" caesar salad that was awesome. I came home and bought romaine and grilled some lettuce...it was awesome! For pecans, I always buy Trader Joe's roasted salted... Thanks for letting me run on about my salad, but it's one of the highlights of my day!